Solid state drives are the single greatest performance increase a computer will see this generation. By choosing a SSD over a hard disk drive (HDD), you’ll be upgrading the slowest component in your computer. 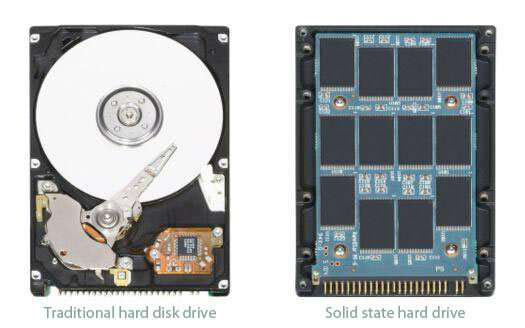 HDDs are laggards in comparison to SSDs because the HDD’s head, the mechanism that reads and writes data, must physically move over the spinning drive platters every time the data is accessed. SSDs don’t have any moving parts, so there’s no mechanical delay when reading and writing data. The latest generation of SSDs can read random bits of data almost 200 times faster than the typical HDD. A mechanical HDD takes about 10 milliseconds to find a file and read data, while a SSD can accomplish this same task in about 1/10th of a millisecond. SSDs also outshine HDDs in reading large files, transferring data at rates greater than 200 megabytes per second, which is nearly double the transfer rate that the current fastest consumer HDD, Western Digital’s VelociRaptor model (105 MB per second) can deliver. In practical terms, if you upgrade to a SSD for your system boot drive, your OS will start-up approximately 3-4 times as quickly compared to starting from a HDD. The lack of moving parts means that SSDs are much more durable than laptop HDDs. Today’s more rugged laptop HDD are designed to withstand an accidental fall from table height to the floor, but in some extreme durability tests, SSDs have been dropped from a three-story building to the street with no ill effects. The greater shock resistance of a SSD means that your files are unlikely to be lost if your laptop is accidentally dropped. Also, unlike laptop HDDs, a SSD is completely noiseless during operation. SDDs are also smaller and lighter than HDDs, reducing the amount of weight you’ll have to carry around. There are a multitude of options available now in the SSD market. The key factor you need to pay attention to is the read/write speed. At the time of this writing, the current reigning champs are the Vertex 3 drives from OCZ. These drives utilize the latest Sandforce controller (which is also available in several other models from other manufacturers), which test after test prove to be the most stable and fastest controllers in the SSD market.